Budgets are traditionally the most political documents a government will release in any given year. Never is that truer than in an election year. Adding to the political drama, the Liberal’s final budget of the mandate was released against the backdrop of a defiant Opposition who delayed Finance Minister Bill Morneau’s budget speech as they raged against the ongoing SNC Lavalin affair. In their pre-election budget, the Liberals eyed ambitious new policy measures aimed at winning over key voting constituencies (millennials and seniors), while continuing to tout their commitment to the middle class. With an election on the horizon and the SNC Lavalin controversy still making headlines, the Liberals delivered a budget that looks to change the conversation with $23 billion in new spending and ambitious new national programs to lower drug costs, increase skills development, and provide high-speed internet coast to coast. Much of this budget does not come as a surprise. The government had been signalling for weeks that initiatives would be considered for first-time homebuyers, that rural broadband would be a priority, and that skills and training would be a focus. Pharmacare has long figured to be part of the election year budget, and seniors are finally getting their due in a government criticized for focusing solely on youth. The Liberals also continued investing in Indigenous Canadians with the largest new funding envelops going to Indigenous communities to improve health and social services, and infrastructure including affordable housing and clean drinking water. The economic forecast is mixed. Coming days after the Bank of Canada warned of a longer-than-anticipated slowdown, the budget projects a rebound in late 2019, and continued growth in years to come. While the budget remains in deficit, government revenues are higher than previously forecast. The budget did not include a plan to get back to balance. Even as the Opposition drowned out the budget speech, Liberals certainly hope the middle class hears their message. The controversy around SNC Lavalin has thrown a hitch in the ‘sunny ways’ agenda. The political climate in Canada has taken a decidedly more negative turn in recent months, and the rhetoric will only get more heated as the campaign draws closer in the spring and summer months. This budget attempts to change the channel by providing cost of living relief for the middle class, in the form of accessible homeownership, lower energy prices and affordable drug prices. These initiatives are designed to speak to voters in the most direct route possible: their pocketbooks. It is intended to highlight simple and easy-to-communicate measures that the Liberals can take directly to voters during the campaign this fall. Budget 2019 projects the Debt-to-GDP ratio will continue to decline even with lower projected GDP growth. It is expected to be 30.7% in 2019, and 28.6% by 2023-24. GDP growth in 2018 was 1.9% with projections of 1.8% in 2019, 1.6% in 2020, and 1.7% in 2021. 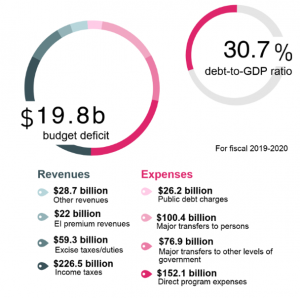 However, despite the higher revenues in 2018 which lowered the deficit to $14.9 billion, the deficit is expected to grow to $19.8 billion in 2018/19. Budget 2019 proposes up to $219.1 million over five years and $3.1 million per year on an ongoing basis for regulatory departments and agencies to develop Regulatory Roadmaps in the agri-food and aquaculture, health and biosciences, and transportation and infrastructure sectors. The goal is to specifically address stakeholder issues, and irritants in these sectors, informed by consultations and recommendations from the Economic Strategy Tables. The Budget also provides funding to continue the government’s work on regulatory cooperation both within Canada and with our trading partners. In addition, Budget 2019 builds upon the Fall Economic Statement, which proposed an annual modernization bill, and the upcoming establishment of an External Advisory Committee on Regulatory Competitiveness. Budget 2019 includes a promise to implement a new retail payments oversight framework to enable retail payment service providers to continue to offer innovation in services, while remaining reliable and safe. The private sector may be disappointed with this budget, as it focuses almost entirely on individuals and includes few new measures for industry. Missing from the budget are several measures that industry and business organizations have been calling on for months, such as a comprehensive review of the tax system, corporate tax cuts or measures to improve competitiveness. The broader goal with Budget 2019’s telecommunication strategy is to introduce a new, coordinated plan to deliver $5-6 billion in new investments over the next 10 years for rural broadband. To achieve this, the government will make significant investment and policy decisions into addressing the digital divide between urban and rural communities, boosting cybersecurity funding to protect Canadians’ data, and the creation of a new national high-speed internet program. The government will create a national ‘access to high-speed internet’ target, which will see 95% of Canadian homes and businesses have access to internet speeds of at 50/10 Mbps by 2026 and 100% by 2030, regardless of their location in Canada. Rural Broadband Investment: Greater coordination with provinces, territories and federal agencies like the CRTC and the $750 million rural/remote broadband fund. Communications Security Establishment Canada: $144.9 million over five years for the government agency responsible for protecting Canada’s communication networks from domestic and foreign threats to address the security concerns with Huawei within the 5G network. Funding will also support the Canadian Centre for Cyber Security in order to provide advice and guidance to critical infrastructure owners and operators on how to better prevent and address cyber-attacks. Cyber security centres of expertise: $80 million to support three or more Canadian networks across Canada that are affiliated with post-secondary institutions. New legislation and amendments to existing federal legislation in order to introduce a new critical cyber systems framework. Canada Infrastructure Bank: will look to invest $1 billion over the next 10 years and leverage at least $2 billion in additional private sector investment to increase broadband access for Canadians. Budget 2019 proposes a one-time transfer of $2.2 billion through the federal Gas Tax Fund to address short-term priorities in municipalities and First Nation communities. Priorities include drinking and wastewater projects. Ottawa’s major focus under this category is on green cars, and one initiative invests $130 million to expand the number of zero-emission vehicle charging and refuelling stations across the country. Transport Canada will receive $300 million over three years to introduce a new federal purchase incentive for electric battery or hydrogen fuel cell vehicles. To help reduce Canadians’ electricity bills—whether they are homeowners, renters or building operators—Budget 2019 proposes to invest $1.01 billion in 2018–19 to increase energy efficiency in residential, commercial and multi-unit buildings. The budget includes investments in the forestry sector, including upward of $170 million for industry transformation, innovation, and access to new markets. Western Canada will be disappointed, as the budget failed to include a firm commitment on the timeline for the Trans Mountain pipeline. There was no new spending on defence and procurement in Budget 2019. The government continues to carefully manage two of the largest acquisitions in the history of the Canadian Armed Forces: The Canadian Surface Combatants and the Future Fighter Capability Project, both of which are in danger of exceeding originally estimated budgets. The government remains adamant that defence spending will only reach 1.4% of GDP by 2024-25. The budget did include $1.39 billion over two years to renew the Middle East Strategy and over $100 million to efforts in Ukraine. As expected, the government will move forward with implementing national pharmacare. While awaiting the final report from Dr. Hoskins’ advisory council, Budget 2019 outlines a series of interim measures. 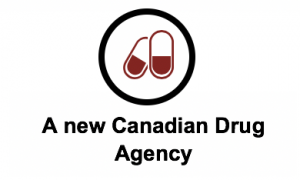 The budget creates the Canadian Drug Agency. The agency will negotiate prescription drug prices, seeking to lower drug costs for Canadians by up to $3 billion per year in the long-term. Part of the agency’s work will be taking steps toward the development of a national formulary—a comprehensive, evidence-based list of prescribed drugs. Ottawa plans to provide the Public Health Agency of Canada with $50 million over five years, starting in 2019–20, to support the implementation of Canada’s first National Dementia Strategy, which is expected to be publicly released this spring. The government has also set aside $25 million over five years, starting in 2019–20, to support a pan-Canadian suicide prevention service. The largest single funding envelope in the budget goes toward Indigenous services. Budget 2019 proposes to invest $4.5 billion over five years, beginning in 2019–20, to continue efforts to close the gap between the living conditions of Indigenous Peoples and the non-Indigenous population, bringing total planned federal government investments in Indigenous programs to more than $17 billion in 2021–22. Overall, the investments amount to an increase of 50% since 2015. The budget includes a significant investment of $1.4 billion over seven years to forgive outstanding comprehensive claim negotiation loans and to reimburse Indigenous governments that have already repaid these loans. The federal government proposes to provide $126.5 million in 2020-21 to establish a National Council for Reconciliation and endow it with initial operating capital. Ottawa also proposes several investments, starting in 2019–20, to ensure that Indigenous students have better access to post-secondary education. The $1.25 billion Home Buyer Incentive would facilitate lower down payments. The Canadian Mortgage and Housing Corporation will take on up to 5% of a mortgage on an old home, or 10% of a new build. To provide first-time home buyers with the assistance they need to purchase or build a home, Budget 2019 will increase the RRSP withdrawal limit from $25,000 to $35,000. The government will also take targeted measures to spur new home construction, including a $300 million Housing Supply Challenge. On top of commitments already made in Budget 2017 and 2018 to provide more affordable rental options, the government is providing an additional $10 billion over nine years in financing through the Rental Construction Financing Initiative by extending the program until 2027-28. As the government signalled, Budget 2019 proposes to establish a new Canada Training Benefit through a federal investment of more than $1.7 billion over five years. The benefit would include two key components: a new, non-taxable Canada Training Credit to help with the cost of training fees, and a new Employment Insurance Training Support Benefit to provide income support when an individual requires time to take off work. With the goal of creating 20,000 new work-integrated learning positions, Budget 2019 invests $600 million over five years. As expected, opposition parties dismissed the budget as each party continues to position and establish narratives ahead of the campaign. The Conservative Party (CPC) made the day all about the SNC Lavalin scandal and used procedural tools to attempt to delay the budget. Once the speech was underway, they resorted to banging on their desks and booing Finance Minister Bill Morneau. They ultimately walked out in protest. When the Conservatives did comment on the budget, they described it as underwhelming. Leader Andrew Scheer criticized the government for their lack of a plan to return to balanced budget and Deputy Leader Lisa Raitt characterized the budget as all sizzle and no steak. The NDP focused on affordability, cautioning that some of the most significant changes being touted wouldn’t be as effective as advertised. New NDP Leader Jagmeet Singh outlined that very few millennials are going to have money in their RRSP to take advantage of the increase to the maximum withdrawal. The NDP criticized measures for homebuyers as insufficient for Canada’s largest markets and pointed out that they did nothing to lower property prices. Singh also criticized the Government for “giving blank cheques” to corporations with no commitments that these investments will result in jobs. Singh repeated multiple times that this government is “not committed to people” but bends over backwards for corporations. Smaller parties stand to play an outsized role in the 2019 election. The Green Party lambasted the government for falling short on climate change initiatives after spending $4.5 billion on a new pipeline. Meanwhile, People’s Party of Canada leader Maxime Bernier targeted indefinite budget deficits. The devil is always in the details, and the details will become clear when the budget implementation legislation is tabled in early April. In the meantime, MPs will fan out across the country in the coming days. Liberal MPs will look to sell the budget to voters in their constituencies, while Opposition MPs will use their time at home next week to keep the SNC Lavalin scandal alive and talk about what wasn’t in the budget. The House of Commons has only nine sitting weeks left until they adjourn in mid-June and the government has several landmark pieces of legislation to pass before then. In addition to this Budget, they will look to pass the contentious environmental bills C-68 and C-69, the national security bill C-59, the firearms legislation C-71 and Indigenous families bill C-92. They will also try to make more progress on key files that are lagging. To date, the $35 billion Canada Infrastructure Bank has only funded one program, the broader infrastructure agenda has sputtered out of the gate, and the Innovation Superclusters have only recently reached funding agreements. Making progress on these key files will be a challenge for a government that recently lost their top public servant and one of the Prime Minister’s most trusted advisors. The retirement this week of Privy Council Clerk Michael Wernick has left a big hole at the very top of the public service in Canada – a hole that Ian Shugart will struggle to fill in the coming weeks.